How would one begin to prepare such Balkan delights as chorba, cashcaval, borsh, or ghiveci? Vladimir Mirodan, a native Romanian, introduces the home cook and expert alike to a world of cooking primarily unknown to the West. The cuisine of Romania, Bulgaria, and Yugoslavia is derived from a culture that evolved along the Danube River—at a crossroads where French, Russian, and Eastern influences meet. The author demonstrates this tantalizingly unique cuisine through 180 authentic recipes based on traditional Balkan ingredients. The Balkan Cookbook is a collection of recipes drawn from the author’s personal collection, as well as those of his family and friends. It offers such delicacies as peppers filled with aubergine caviar, salads with Bulgarian yoghurt dressing, Chicken Terrine in Garlic Aspic, marinated trout, braised lamb with spinach, and many more. 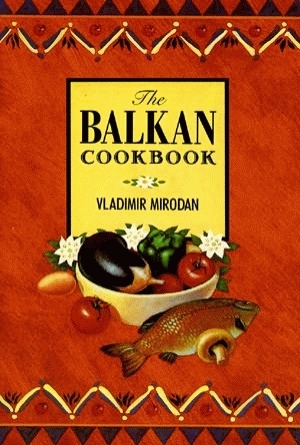 Along with a full array of recipes, this complete entertaining guide provides a brief history of Balkan cooking and contains full Balkan menus and an index of appropriate wines and spirits. Actor-director Vladimir Mirodan is a lifelong gourmet committed to the promotion of his native region’s imaginative cooking. His emphasis is on Romania, which he describes as “an enclave of Latin indulgence in a sea of Slav earthiness.” He is dedicated to the preservation of traditional Balkan cooking, noting that changes in Balkan society could mean the eventual extinction of this cuisine.